Watching a player perform a slide tackle at full speed to steal the ball away from an opponent is one of the best things to watch as a soccer fan. But in the middle of a game (when everything is happening at 100 miles per hour), performing this slide tackle legally is easier said than done. Which is why we must teach it correctly. Understanding how to slide tackle legally and with control is important so that players don’t cause reckless injuries on the pitch. Most games a littered with fouls as players mistime tackles and bring down their opponents. Use the 10-step guide below to teach your players how to slide tackle legally. FREE DOWNLOAD: Get 12 "Soccer Passing Drills" to use at your next training session for free (Click here to download). Because of this, the first thing all players must understand is that that they should never use the slide tackle if challenging while staying on their feet is an option. But, there will be times when a player has no option but to slide in. The most common time this will occur is when a player is running beside their opponent who has possession of the ball. Knowing they have the speed to power away, a player may need to use the slide tackle to prevent them from having a free run at goal. It’s a tough move to pull off as your opponent’s speed and trickery means they you could end up swiping at air or bringing them down for a foul in a dangerous position. So, use it as a last resort! Avoid using the slide tackle in the box unless it’s absolutely necessary and you’re almost certain that you’ll win the ball. You should also refrain from slide tackling from behind or with your studs up as this will likely result in a red card and your dismissal. Timing and technique are everything when it comes to sliding in and winning the ball cleanly. 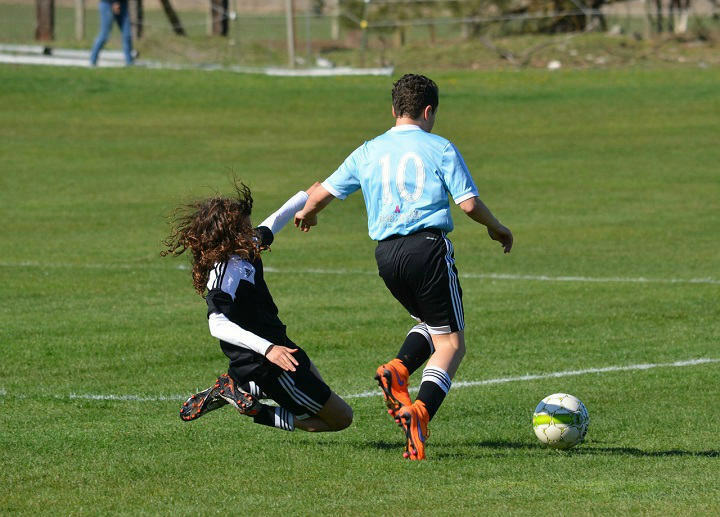 Once you have positioned yourself alongside the opposition player, there are a few things that you need to think about before you make the tackle. Where you are on the pitch often determines your options when tackling. A slide tackle is a good option when you’re near the touchline as you can hopefully hook it out of bounds and give your teammates time to get back into position. In the centre of the pitch, a slide tackle is more problematic as the ball will remain in play. If an opposition player arrives to the ball quickly, you’ll be at a disadvantage as you’ll be on the floor and won’t be able to recover quickly. Once you’ve judged the situation and determined you do need to make the slide tackle, it’s important to decide where you want the ball to end up. 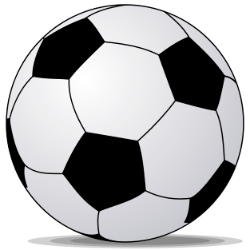 Is it possible to emerge with the ball and regain possession for your team? Do you want to knock the ball out to shut down their threatening play? Your decision on this will help you understand exactly how you need to perform the slide tackle. Keeping your eyes glued to the ball will increase the chances that you’ll make a successful challenge. While the player may feint and dummy in an attempt to throw you off or draw a foul, by watching the ball you’ll be able to avoid their trickery most of the time. The best time to slide in is when the opponent has kicked the ball out in front of them and it’s on the side nearest to you. With the ball a metre or two in front of them, if you judge the distance correctly and time your slide to perfection, you’ll avoid the risk that they’ll take a quick touch just before you make the challenge and you’ll end up fouling them. Next up, let’s talk about specific slide tackle technique. While your other leg is used for winning the ball back, the leg nearest to your opponent should be bent at the knee to drop your body down in the right direction. It also helps to spring you back up after sliding in. This leg will usually end up under your bottom with your foot slightly out to the side so that you don’t land on it with your full weight. As you go to ground, your tackling leg should extend towards the ball while the other leg bends beneath you. If you have positioned yourself correctly and timed the slide tackle to perfection, your extended foot should now be arrowing towards the ball ready to hit it away. All of this should be happening in one smooth motion. While some players can tackle with the leg closest to their opponent, it’s an incredibly difficult movement and you have a greater chance of taking out your opponent or missing the ball. By making sure that you land on the hip of your bent leg, you’ll give yourself better control of the foot of your sliding leg. This will help you choose where the ball will end up. Tackling with you studs up is dangerous, illegal, and risks injuring your opponent as well. Instead, point your toes towards the ball when sliding in and strike the ball with your laces or the tips of your toes if you’re struggling to reach. Never slide in and attempt to knock the ball away with your heel. Step #8: Strike the Ball Away! Perform the perfect slide tackle requires that you strike the ball with your foot before you make contact with the opposing player (if you even do). If you aim to hit the ball too low, you risk the ball bouncing over your foot. If you aim to hit the ball too high, the ball may go under your foot. Timing and great aim is incredibly important! When you do slide in and make contact with the soccer ball, make sure you’re clearing it into a smart position. If possible, attempt to play it to one of your teammates. Or you can even attempt to emerge with the ball yourself. If you are looking to retain possession of the ball after the challenge, attempt to hook your foot around the ball and scoop it towards the area you have the best chance of springing up and getting to first. One of the key disadvantage of the slide tackle is that it puts you on the ground for a second or two after you’ve executed the tackle. This can give your opponent and advantage (especially if you miss the ball). Even if you are able to make the perfect tackle, the ball may still end up with and opposition player while you’re laying on the pitch. Which is why it’s incredibly important that you get to your feet as quickly as possible so that you can continue get back into position and help your teammates. This is why we talked about the importance of sliding onto your bent leg. This will help you retain control and spring up to your feet quicker. A 10 step guide showing you exactly how to perform the perfect slide tackle. 1. Weight up the situation. 2. Know what you want to achieve. 3. Focus on the ball. 4. Bend the leg nearest to your opponent. 5. Tackle with the leg furthest from your opponent. 6. Land on your hip. 7. Aim with your laces. 8. Strike the ball away. 9. Clear to a smart position. But knowing to do so can be crucial to your team winning and losing a game. When you’re the last defender and there’s a striker barreling towards the goal, being able to slide in and knock the ball away with perfect technique and timing can decide a game. Get to the training ground and work on it! Sign up to our soccer coaching newsletter and we'll send you a quick email each time we publish a new post. Never miss them! This session about slide tackling was very much informative. I have a minor suggestion. If you could include images for each step, then it would be great. Thank you for your interest in providing more sessions like this. Subscribe to the #1 Soccer Coaching Newsletter! Subscribe to the Soccer Coaching Pro newsletter and receive emails that will improve your coaching knowledge and ability! Are you a Soccer Coach? Sign Up Below and I'll Send You 12 Passing Drills for FREE! Enter your email below to get the "12 Soccer Passing Drills" for FREE!